Minneapolis Pride: "Queer is hot, war is not!" | Fight Back! 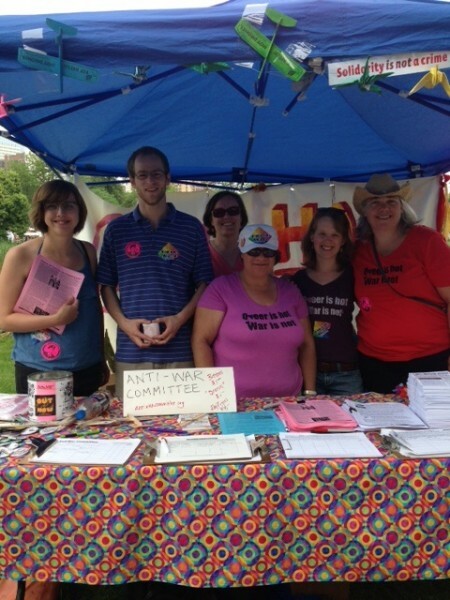 Minneapolis, MN – The Anti-War Committee had a big presence at the Pride celebration held here, June 29. Meredith Aby of the Anti-War Committee states, "It was fun organizing today at the Minnesota Pride where people are coming off the recent victories which legalized gay marriage here in Minnesota and throughout the country. One woman I met asked me, 'Do you think they will ever stop these wars for profit?' Then she answered her own questions and said, 'Well I never thought we'd win the gay marriage fight. So, yeah, organizing does make a difference!' People in Minnesota feel empowered and are ready to fight more battles for justice." 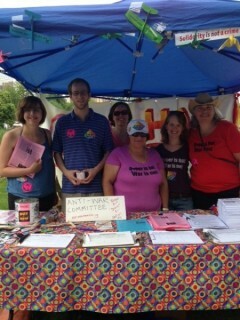 Aby continued, “The Anti-War Committee got a great response at LGBT Pride today. Our "Queer is hot, war is not!" stickers went quickly. Our Palestine solidarity campaign also got folks' attention. In particular, people were shocked to hear about the pinkwashing campaign Israel is conducting to cover up their treatment of Palestinians - both queer and straight." On June 30, the Anti-War Committee will join the Peace Contingent in the Pride parade, along with Women Against Military Madness, the Minnesota Committee to Stop FBI Repression, Free Bradley Manning-Minneapolis and others. The Parade will line up at 10:30 a.m. and march from 11:00 a.m. until 2:00 p.m. The parade lineup runs along 3rd Street South from Hennepin Avenue towards the Metrodome. WAMM has reserved spot #49 in the parade.